Fig. 1: The checked multimeters. Every multimeter has a certain measuring inaccuracy that is specified in the user manual. How to interpret these tolerances and what they mean is described in the article Measurement accuracy. Besides this, measurement deviations can be caused by the manner how multimeters the offered voltages and currents process to get a reading on the display or moving-coil meter. These types of abnormalities are rarely discussed in user manuals and are brand and model specific. To get an insight in the types of abnormalities that can occur, five different multimeters are examined with five different waveforms: a direct voltage, a sine-wave voltage, a halve-wave rectified sine, a symmetrical square-wave and an asymmetrical square-wave. The values in the yellow rows are the references: mean, RMS en de standard deviation, who are measured with an oscilloscope who calculates the values according to the correct mathematical definitions. The oscilloscope prior to the measurements calibrated with a DC voltage to an Agilent 34410A multimeter. The AC and the rectified sine-wave voltages are derived from a transformed mains voltage. These voltages have a little distortion mainly visible by the flattened tops. The tests are carried out with voltages, but the results are comparable for the current range. The major flaws are highlighted in red. A multimeter will measure the mean value of the provided voltage when this is set to a DC-range. The results show no abnormalities when reading this parameter regardless the type of waveform. The AC-range of a non-RMS multimeter is designed in such a way that when measuring a sine-shaped voltage, the result is correct, despite the lack of a RMS converter. It's not surprising that non of the multimeters has problems with sinewave voltages. The Agilent and Fluke multimeters show the correct RMS-value of a square-wave voltage who has a mean value of zero volts. The read values of the other three instruments do have a significant deviation. It's striking that neither of the five multimeters measures the correct RMS-value when performing a test with a rectified sine or an asymmetrical square-wave. On the other hand it's remarkable that the two True-RMS meters: the Agilent 34410A and the Fluke 177 read a value that corresponds with the standard deviation. Later on more about this in the chapter "True RMS". The test with the DC-voltage with the multimeters in the AC-range shows that the Ц4324 & Elro M970 doesn't have AC-coupled inputs: they don't block the DC-voltage. This makes it impossible to measure the AC-portion of a voltage that is superimposed on a DC-voltage. One meter, the Elro M970, appears to be polarity sensitive in the AC-range. This is expressed when doing a test with a direct voltage and the two pulsating DC-voltages. The instrument showed a much too high value, and when swapping the test leads the meter read zero volt. This is caused by a simple rectify circuit that is implemented in the multimeter. Fig. 2: "True RMS"? or is it "True standard deviation"? The above described comparative test makes it clear that even multimeters like the Agilent 34410A and the Fluke 177, who claim to be "True RMS" meters, are unable to determine the RMS value of a pulsating DC-voltage. It appears that the measurement results correspond to the standard deviation. When measuring voltages who lie symmetrical around zero volt, like the sine-wave and symmetrical square-wave, the reference RMS value corresponds with the reference standard deviation. This led to the conclusion that True RMS multimeters actually measure the standard deviation in stead of the RMS value. The measurement results are explicable: The multimeter measures the "RMS" value only when the AC-range is selected. (The DC range measures always the mean value.) The case is that the AC range is AC coupled, and an eventual present direct voltage is blocked and doesn't take into account in the measurement. The calculations beneath show the effects of an AC-coupling on the measurement results in case of an impulse voltage. Fig. 3: In the left column a DC impulse voltage is generated. u(t) and the average voltage of this signal is calculated. In the middle column shows this signal in a graph and the RMS-value is calculated. The column on the right shows the same signal after an AC coupling. The calculated result of u(t)-Ugem is the standard deviation. The same goes obvious for a current measurement. When using a multimeter, be aware that the frequencies of the measured signal lie within the frequency range of the instrument. If the measured voltage or current consists of too high or too low frequencies, it will lead to measurement errors. This applies not only to the fundamental frequency, but also the higher harmonics can cause faults. The DC-range will average the measured voltage or current. This can accomplished by the mechanical inertia of moving coil meters, a RC low-pass filter as used in digital instruments or other means. This average value will be presented on the display. It is possible, when measuring a low frequent pulsating direct or alternating voltage, that the time constant isn't sufficient and residues of the impulses penetrate into the measurement system. This will manifest in a vibrating pointer of a moving coil instrument or an unstable readout in case of a digital instrument. The five multimeters are tested with a 0...5 V square-wave that has a duty-cycle of 50 %, and with this the frequency was sought where the readout was stable and the relative error was less than 1 %. The results of this test are presented in the column "DC-min" of table 2. Digital multimeters can also show seemingly stable values at lower frequencies than those mentioned in the table. This is due to interference. The impulse frequency of the measured signal is than a multitude of the sample frequency of the multimeter. The readout value is in that case totally unreliable. The DC-range has no upper frequency limit. The measured voltage or current is filtered whereby higher frequencies can't penetrate and therefore don't have any influence. The AC-range has a lower as well as an upper frequency limit wherein signals can be measured correctly. The lower frequency limit is determinate by the high-pass filter. The lowest measurable frequency in the AC-range is in general lower than that of the DC-range. Also in the AC-range at low signal frequencies interference phenomena can appear. Fig. 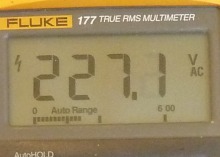 4: AC voltage range frequency characteristic of a Dynatek multimeter. Rectifiers and RMS-converters can't handle the high frequency signals, or the internal sample frequency of the multimeter is the limiting factor. Often a low-pass filter is been used. The lower and upper frequency limits of the five multimeters are measured. The results are respectively shown in the columns "AC-min" and "AC-max" in table 2. The frequency band wherein the multimeter measures within the tolerances is always specified in the user manual. Figure 4 shows the measurement deviation plotted against the frequency of a non-RMS multimeter with the AC-range selected. The test is carried out sine wave and a square wave with a duty-cycle of 50 % and 20 %. It's obvious that these multimeters aren't suitable to measure non-sinusoidal voltages. Multimeters can easily been overdriven when measuring impulse shaped voltages. 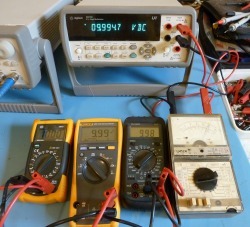 The five multimeters in this test are connected to a voltage source who generate DC impulses with an adjustable duty-cycle and voltage with a maximum of 60 volts. The repetition rate is 100 Hz. Fig. 5: DC impulse test voltage with a repetition frequency of 100 Hz and a duty-cycle of 5 %. As expected all multimeters measure the average value of the impulse voltage correctly in the DC-range. This is due to the passive filtering of the signal before this is processed by the A/D-converter. Because the average value is much lower than the peak value, there is a risk that the peak voltage is so high that the maximum input voltage will be exceeded. The multimeter could therefore be damaged without warning. There are no problems in the autorange VDC. The Fluke 177 has an extra DCmV range for voltages up to 600 mV. This range causes measurement faults if impulse voltages (100 Hz, 5 % duty-cycle) are measured. Below a voltage of 3 Vtop the measurements are correct. But if the amplitude becomes higher the faults becomes rapidly higher. At 2.92 Vt the fault is 0.32 % and at a little higher voltage 3.03Vt it's already 2.0 %. This rises to a fault of 70.3 % at 7.35 Vt. The overload notification appears only at voltages above 7.38 Vt. The auto-range of the Agilent 34410A will select always a range that is higher than the peak voltage. And if manually a range is selected it will give an overflow when the peak voltage is higher than fits within the range. The multimeter has some problems with the determination of the peak voltage if the impulse width gets smaller than 42 μs (-3 dB @ 13 μs). This is independent of the impulse frequency. If the impulse width becomes too small and a smaller peak voltage is measured, it's possible that a too sensitive range is selected. This could cause a measurement error. For example: at a frequency of 10 kHz and 3.3Vt with an impulse of 7 μs the 10 V range was selected and the correct value of 482 mV was measured. With a slightly smaller impulse width of 6 μs the autorange selected the 1 V range and 288 mV was measured with an error of 31 %. After manual selecting the 10 V range the correct value of 416 mV was measured. Non-RMS meters in the AC-range can't measure anything else than sinusoidal wave shapes correctly. Therefore only the two RMS-multimeters are subject to this test. It's taken into account that these instruments actually measure the standard deviation. The measurement signal had a frequency of 50 Hz and a duty-cycle of 10 %. Because the specified bandwidth of the Fluke is 1000 Hz, the impulse signal is filtered with a 450 Hz RC-low-pass filter. Both multimeters measure the standard deviation correctly. Higher harmonics can cause measurement errors that are greater than the numbers specified if the signal isn't filtered.